Combine a couple of existing PDF files and merge them into one PDF file. If you create PDF files over a printer driver you often have the problem, that you can not create the file with one print job. Because you need parts of the document from a number of programs. Don't worry about this. 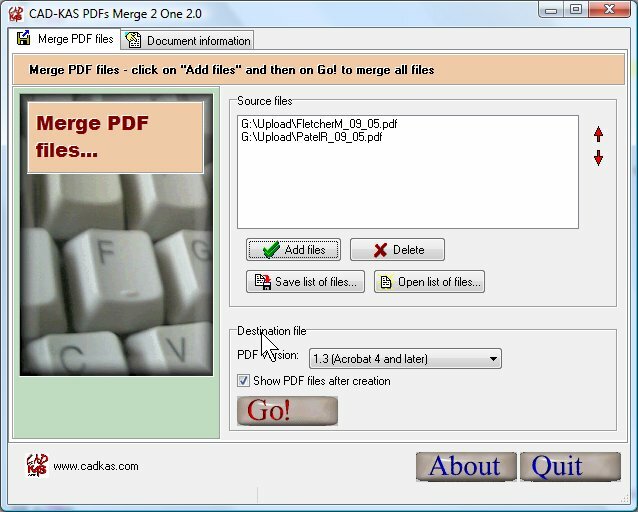 With PDFs 2 One you can merge together the PDF files after there creation. Download a couple of PDF files from Internet and then melt together what belongs together. So you can search for information easier or distribute the document in a more compact form. If you want to split and merge pdf files you can use PDF Split and Merge instead. PDFs 2 One was rated with 5 stars by software directory topshareware.com.